That quilt is beautiful. I have always wanted to try one like that. Maybe someday I will. I hope that you get your sewing machine working. It is frustrating when it won’t. I would loan you one if you lived closer. The girls each have one, I have an electric one and my treadle. I hope that your plans work out for dinner. Winter does have a way of changing plans. Have a great day with your family. That is a beautiful quilt! I bet it looks just beautiful on your table. I hope you can get your sewing machine to working. I am sure the kids are excited to be out on school break. We are taking a break until January starts. Mine are in such early grades (2 are in K and 1 in 3rd), so it really does not hinder us being behind any. I hope you have a wonderful day today. That is such a nice quilt. Makes me want a Christmas tablecloth. It’s not looking like we will be able to make it on Sunday either. Quentin hasn’t had time to change his water pump. It looks like we will snowed in too. 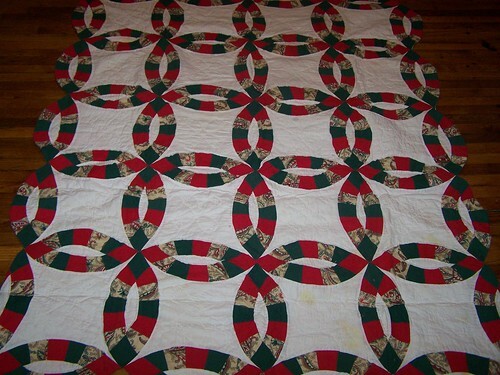 The quilt is lovely! What a pretty tablecloth it must be! I want to wish you and your family a very Merry Christmas! May God’s love & presence bless all of you! This is such a beautiful quilt. And, what a great way to decorate your home with it!